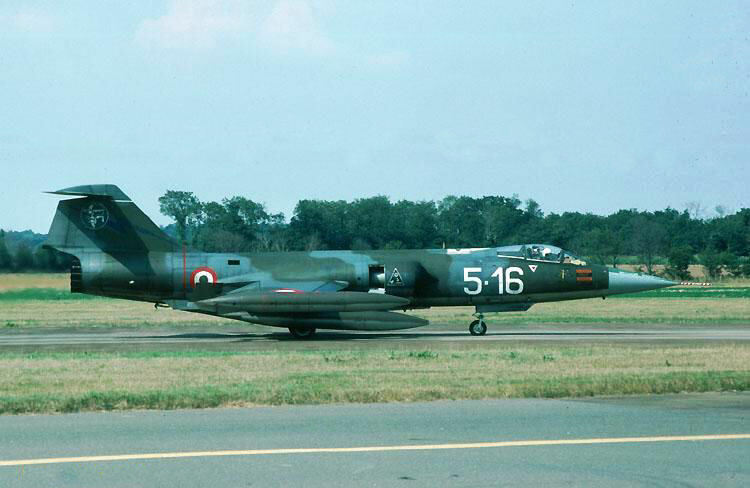 This month a German Navy MFG2 staffel based at Eggebek, flying the F-104G exchanged with Royal Air Force 56 Squadron based at Wattisham flying the Phantom FGR.2. It was a one-way exchange where five F-104Gs and one TF-104G flew to the UK. 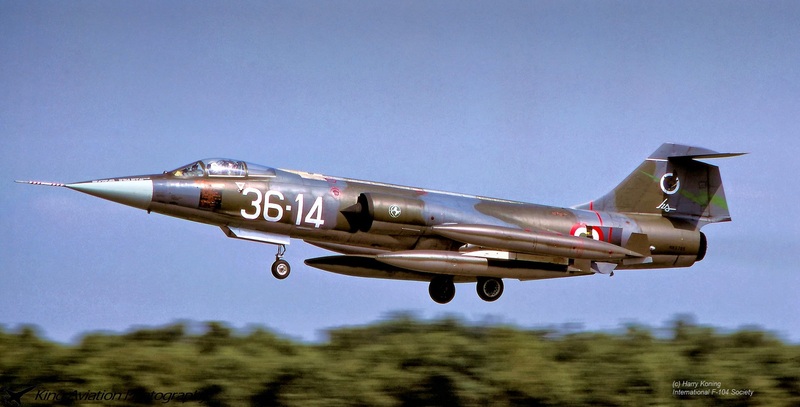 This period Dutch Air Force 306 Squadron based at Volkel AB, flying the RF-104G exchanged with German Air Force 1 staffel/JBG32 based at Lechfeld AB, flying the F-104G. It was a 1 way exchange where a number of Dutch Starfighters flew to Lechfeld in the afternoon of April 26th. Due to the busy operational schedule, such as a deployment to Decimomannu, JBG32 could not find any time and possibilities to have a delegation exercises from Volkel as well. 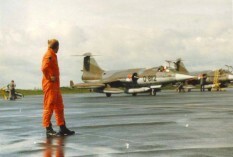 The Dutch delegation got support by Fokker F-27M Troopships from 334 Squadron. To Lechfeld by C-10 and back home by C-12. 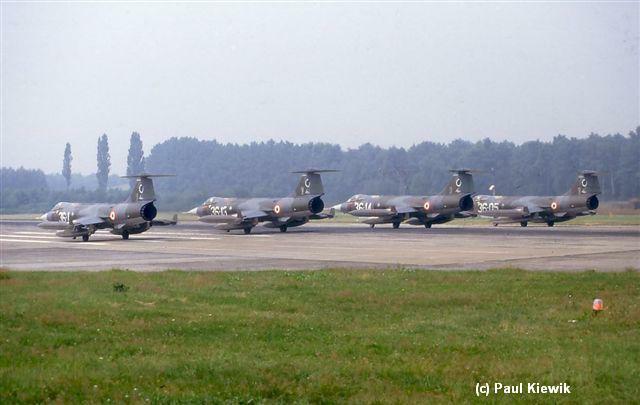 Starfighters from 306 Squadron seen at Lechfeld were D-8052, D-8066, D-8103 and D-8112, all RF-104G. 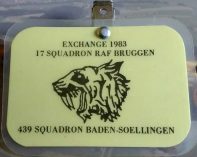 IFS Note: It is a bit strange that a specific recce squadron exchanged with a typical Fighter Bomber squadron in Germany. Formation photo beneath was taken by pilot Rene Arnts (over Germany). The other photos thanks to Ferry van der Geest. 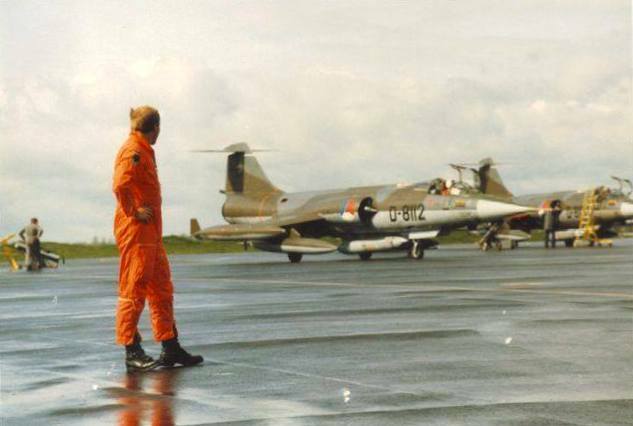 Last photo shows the departure to Holland with Günther Weiss (commander) waving the Dutch Starfighters goodbye. Note: This was the first of two exchanges in 1983 for this German Staffel. This period (likely four) Starfighters from the Italian Air Force 132 Gruppo based at Villafranca exchanged with 42 Escadrille, based at Florennes and flying the Mirage 5BR. It was a 2-way exchange. 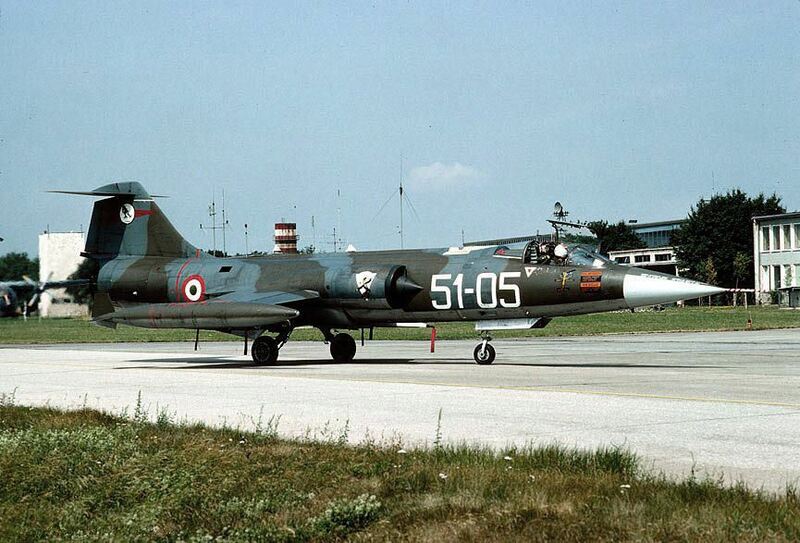 Italian Starfighters at Florennes included F-104G MM6535 code 3-06. 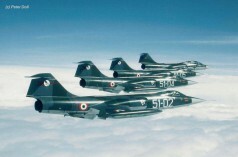 This month a German Navy MFG2 1st staffel based at Eggebek, flying the RF-104G exchanged with Hellenic Air Force 345 Mira based at Souda AB and flying the A-7H. 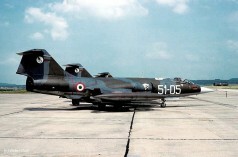 It was a two-way exchange where five F-104Gs and one TF-104G flew to Greece. According 345 Mira the Corsair aircraft arrived at Eggebek on May 17th and the exchange ended on May 25th. This period four Starfighters from the Italian Air Force 12 Gruppo based at Gioia Del Colle exchanged with 315 Squadron at Twenthe AB flying the NF-5. It was a 2-way exchange. 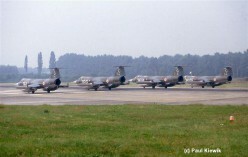 At Twenthe 4 Starfighters were seen flying around being MM6740/36-05, MM6807/36-11, MM6800/36-13 and MM6705/36-14. The Italians also brought a C-130H Hercules MM61990/46-04 which was seen at Twenthe on 28 June and 7 July. 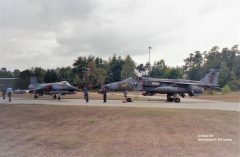 The photo beneath shows all 4 Italian Starfighters ready for their return back to Italy after the exchange (by Paul Kiewik) and another photo shows the MM6705 code 36-14 landing at Twenthe and MM6807 code 36-11 taxying during the event (both by Harry Koning). Also the flyby photo was taken by Harry Koning. This month the Italian Air Force 21 Gruppo based at Cameri AB and flying the F-104S exchanged with Spanish Air Force 142 Escuadron (ALA 14) at Albacete, Spain flying the Mirage F1CE. 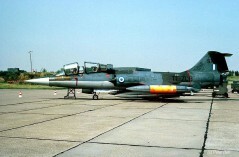 Some stated that 4 Starfighters flew to Spain but we have no confirmation about that yet. At least Spanish Mirages were seen at Cameri this period in July. This month four Starfighters from the Italian Air Force 22 Gruppo based at Istrana, flying the F-104S exchanged with German Air Force JBG34 at Memmingen flying the F-104G. The aircraft were MM6804/51-02, MM6764/51-04, MM6703/51-05 and MM6937/51-20, added was MM6720 code 51-03 which replaced one of the others. One C-130H Hercules arrived with the 104s being MM61993/46-12. Photo beneath shows MM6804 code 51-02 leading a formation over Southern Germany and another photo showing MM6703 code 51-05 with others at the Memmingen flightline and taxying. (Photos Peter Doll). Pre exchange visit was performed by aircraft MM6763 code 51-06 and MM6824 code 51-14 which flew to Memmingen on May 31st. 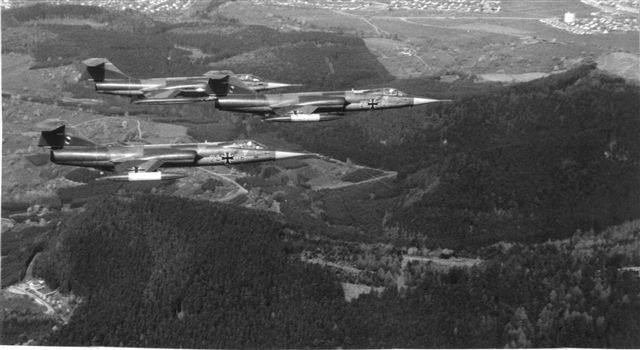 The Germans flew to Istrana with five Starfighters being F-104G 20+05, 23+94, 25+59, 26+49 and TF-104G 27+97. This month Royal Air Force 41 Squadron based at Coltishall, flying the Jaguar GR.1 exchanged with the Canadians at Baden-Sollingen, flying the CF-104. It was a 2 way exchange (maybe shifted). At least Starfighters were seen at Coltishall. 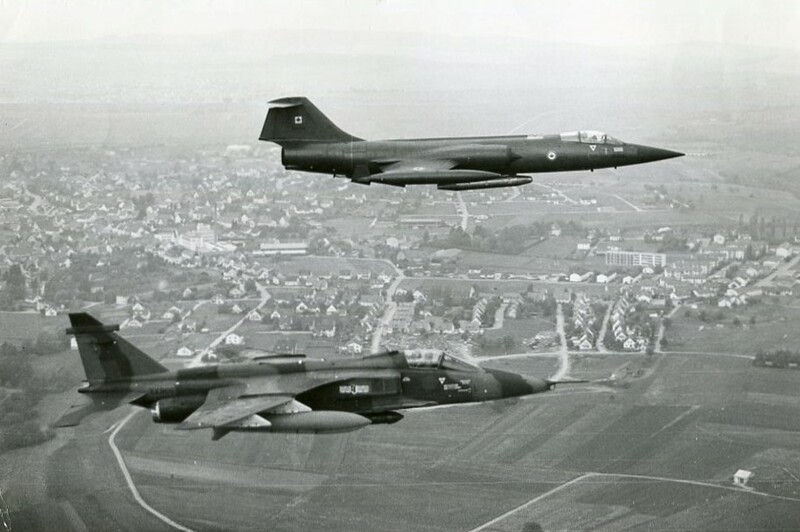 This month the German Air Force JBG32 (1st Staffel) based at Lechfeld AB, flying the F-104G, participated in a squadron exchange with RAF 14 Squadron based at Bruggen, Germany, flying the Sepecat Jaguar GR.1. It was a two-way exchange. 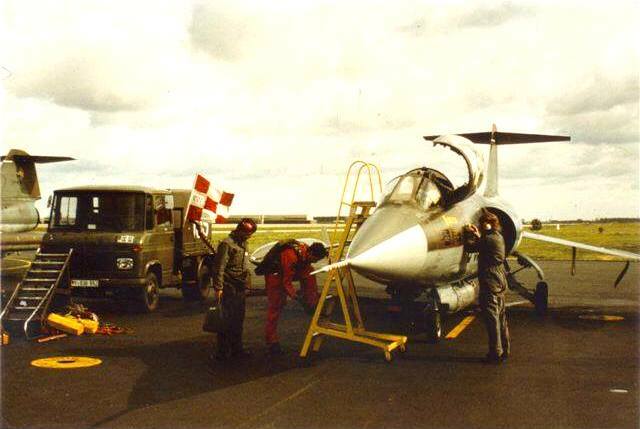 During this period two different F-104 squadrons were rotating with Bruggen Jaguar squadrons which made quite some interesting traffic at the Air Base. Four Jaguars flew to Lechfeld on July 22nd and returned back home the 29th. 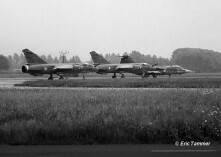 The German Starfighters landed at Bruggen on July 25th and flew back to Lechfeld on the 29th. The four participating aircraft were F-104G 21+90, 24+02, 24+69 and TF-104G 27+26. The Do-28D 58+53 (JBG-32) provided transport on the 25th while Do-28D 58+55 (JBG-32) provided transport on the day of departure. Beneath a copy of an article inside a base published newsletter. Information thanks to Hans-Jürgen Breuer. This period the Canadian Air Force 439 Squadron based at Baden-Sollingen AB, flying the CF-104 exchanged with the Royal Air Force 17 Squadron, operating the Jaguar GR.1 at Bruggen. It was a 2 way shifted exchange. First the Starfighters visited Bruggen in July/August while the Jaguars were at Sollingen between 6th and 13th of September. Beneath photos thanks to Steve Hill, processed by the photogroup Bruggen when the CF-104s were at Bruggen and a photo showing the Jaguars at Sollingen in September with CF-104s in the background. The Starfighters which landed on July 25th were : 104711, 104737, 104761, 104799, 104826, 104837, 104873 and 104893, all wearing 439 Squadron markings. Support was provided by C-130 130321. The next day two-seater CF-104D 104650 (439 Squadron markings) arrived which departed again on the 29th. Aircraft 104799 flew back to Sollingen on the 27th when also a CT-133 (133450) visited Bruggen for a crew ferry. 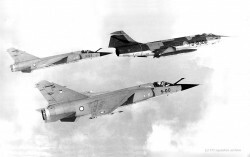 First noted on the 29th were new CF-104's 104865 and 104891 (both 439 squadron markings). The 104891 departed again on August 2nd. The next day, August 3rd, two extra aircraft arrived being 104760 and again 104891 (both 439 Squadron markings). On the final day all Starfighters at Bruggen returned to Sollingen again together with a C-130 for transport. After take off, two CF-104s returned (104865 and 104891) performing a low fly by over the 17 Squadron area with full afterburners! 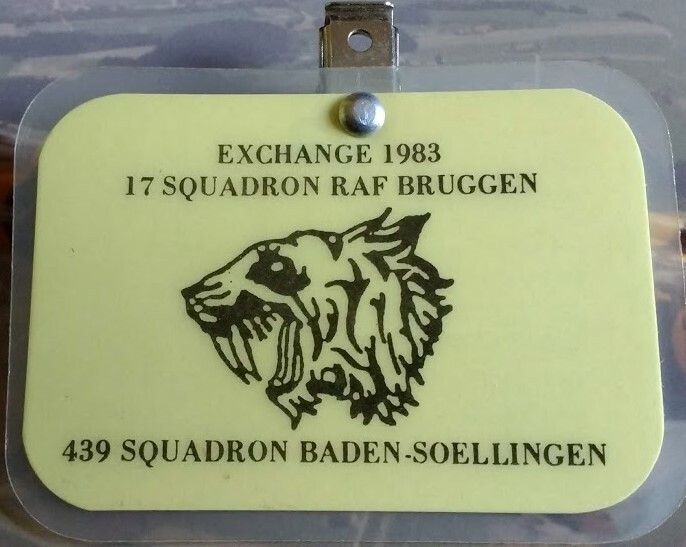 It is interesting to see that the squadron brought three Starfighters to Bruggen which had just been received the day before from 417 Squadron in Canada! !, 711,799 and 650) Exchange information thanks to Hans-Jürgen Breuer. 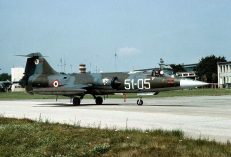 This month four Starfighters from the Italian Air Force 102 Gruppo based at Rimini, flying the F-104S exchanged with USAFE 510th TFS/81 TFW at Bentwaters flying the A-10A. It was a two-way exchange. The Starfighters were MM6887/5-07, MM6833/5-16, MM6946/5-06 and MM6924/5-12. The last two aircraft arrived August 17th, one day after the first two. On 5 July 1983 two Starfighters made already a pre-exchange visit to Bentwaters. These were MM6833/5-16 and MM6836/5-24. During the exchange the Italians also brought an C-130H Hercules, MM61991/46-05. Note: Some reports show 92TFS in stead of 510TFS (both belonging to 81 TFW). We are still looking for confirmation. Beneath a photo of MM6833 code 5-16 at Bentwaters. 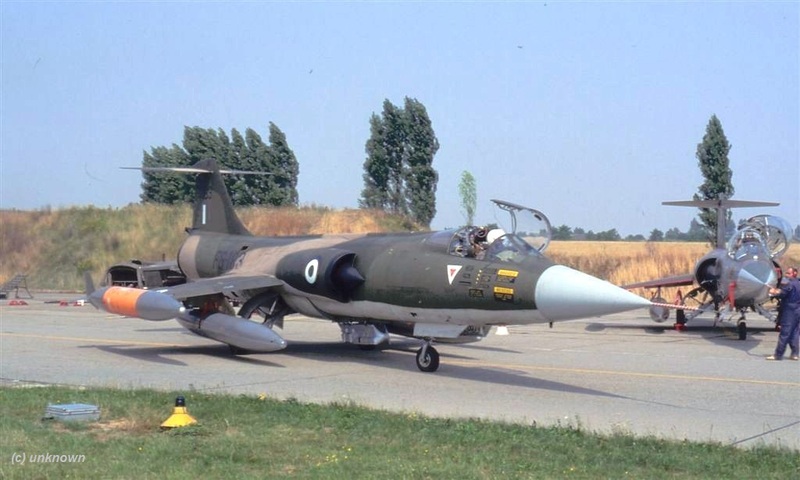 This month a Belgium Air Force Mirage 5 Escadrille based at Bierset, exchanged with Hellenic Air Force 116 Pterix based at Araxos AB, flying the F-104G. 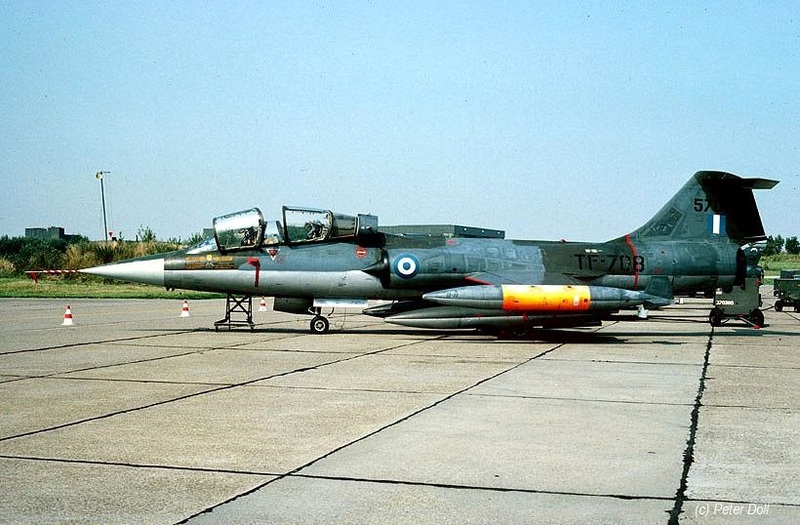 It is unknown if it was a 1 or 2 way exchange but at least a number of Greece Starfighters visited Belgium being F-104Gs 7172/FG172, 7176/FG176 and 7183/FG183 and TF-104G 5708/TF-708. Beneath a photo showing 7183 taxying on the flightline at Bierset during the exchange and 5708 on the platform still wearing the old Luftwaffe color scheme. 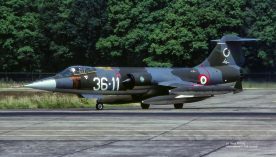 This month the Italian Air Force 155 Gruppo based at Istrana, flying the F-104S exchanged with Royal Air Force 16 Squadron, flying the Buccaneer S.2B, based at Laarbruch. It was a one way exchange were only the Buccaneers flew to Istrana. 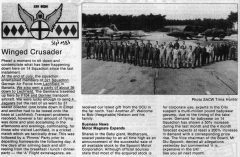 This month a squadron exchange toke place between the Spanish Air Force ALA 12, flying the F-4C from Torrejon Air Base, and the Canadian 1 CAG flying the CF-104 from Sollingen, Germany. 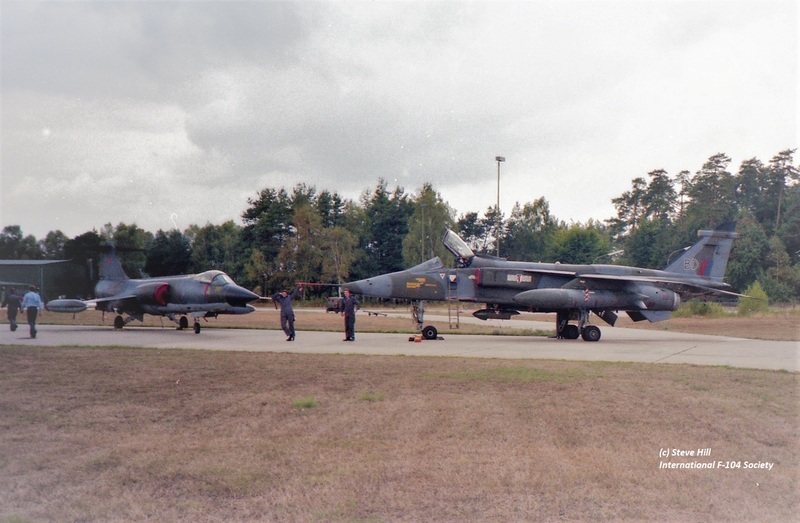 All 3 Sollingen based units (421, 439 and 441 SQN.) were involved! 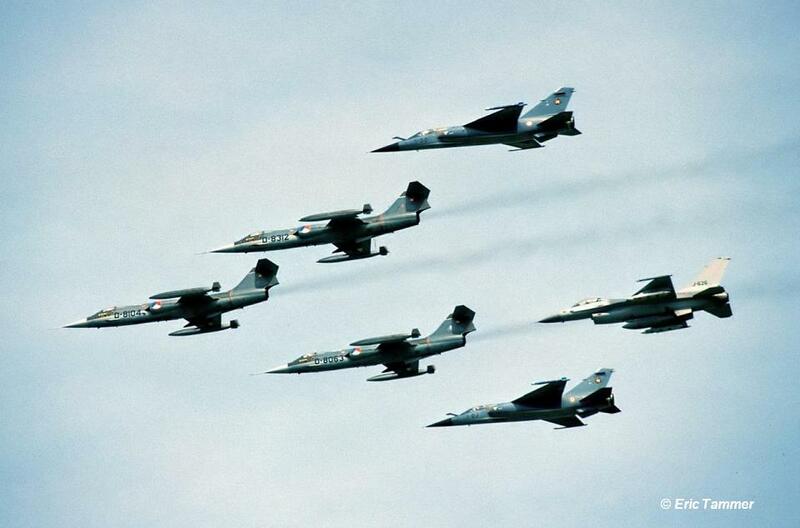 It was a “joint” 2-way exchange with four CF-104 aircraft flying to Torrejon! The pre-exchange reported toke place during August at Getafe instead of Torrejon (at the time Torrejon was a mixed EdA-USAFE base, with some restrictions about the use). Please take note that Spain joined NATO only during 1982 and was put into the Squadron Exchange program from 1983. During the first year (1983), only ALA 12 and ALA 14 participated in exchanges.